The installation was overseen by White Light’s Project Manager Jason Larcombe. He explains: “We were approached by the Science Museum who came to us with their vision for the space and what they wanted to achieve. They wanted both an intuitive and user-friendly system that can reach the demands of any client; covering everything from the biggest conferences to more intimate events. It was our task to draw on our experience of managing other venues, alongside our technical knowledge, to select a range of products that were bespoke to Illuminate and could fulfil the Science Museum’s vision”. This included d&b Y-Series amplifiers and speakers, whose portability means they can be moved around the space and offer a solution bespoke to each event. Yamaha QL1 Series desks were chosen for their reliability, portable control and the fact that they are the go-to desk for the majority of technicians and operators. These are run on the Dante network, allowing additional resources to be easily integrated to suit a client’s requirements. A lot of the equipment used within the space is also a continuation of White Light’s relationships with the manufacturers and the company’s commitment to investing in the very latest technology. Jason explains: “A lot of the products match those we already have in our extensive hire inventory, meaning clients will be able to resource an entire production internally; a system which has proved extremely useful for our other managed venues. It also allows Illuminate to remain competitive as a venue as it is completely flexible and can change quite significantly; dependent on the client’s needs”. White Light Director Richard Wilson adds: “We are very proud of our long-standing relationship with the Science Museum. 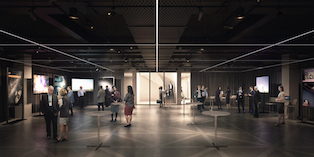 As two technology-focused organisations, we felt we could very much add value to Illuminate for their incoming venue clients and cannot wait to showcase this brilliant space following the official launch in January 2019”.